When Obama first entered the race for President, many Russians could not get past his skin color. Prior to his win, tabloids constantly referred to him as “the black-skinned candidate” and the Russian public, not overly concerned with political correctness, seemed happy with the label. But as Obama prepares to visit Moscow on Monday, there are bigger issues at hand, and Russians are starting to warm to the American President as they look beyond his pigmentation and turn their focus to his policies. 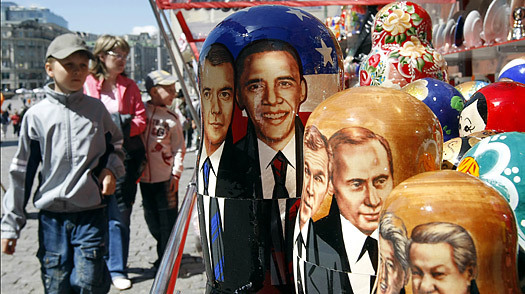 For many Russians, Obama’s color has been replaced with a raft of other, weightier concerns. Relations between the U.S. and Russia eroded to a Cold War low under the Bush Administration, with tension over issues such as Russia’s refusal to recognize the statehood of Kosovo and America’s proposal to build an antimissile shield in Eastern Europe. People like Yevgeny Abashin, 40, who works in the travel industry, see Obama as a breath of fresh air after George W. Bush. “For me and for most of my friends color doesn’t make a difference,” he says. “We think if anything it makes him more original.” But when it comes to just how differently Obama will deal with Russia, Abashin, like so many others, is taking a wait-and-see approach. “We watch the elections in the U.S. very closely because in theory Russia and the U.S. are potential enemies,” he says. But only time will tell if Obama’s policies prove effective. “We don’t know Obama, but we are testing him to see what he can do,” says Pavlovsky. “I think in either case the Kremlin will give him a chance. It will be like repaying a debt we owe to the United States for their faith in Gorbachev.” When it comes to the U.S. President, at least, it seems Russia may have finally gone color-blind.